It’s been a number of years since we last visited Blackpool, one of England’s premier seaside resorts, so we thought we’d return and see if it had changed. 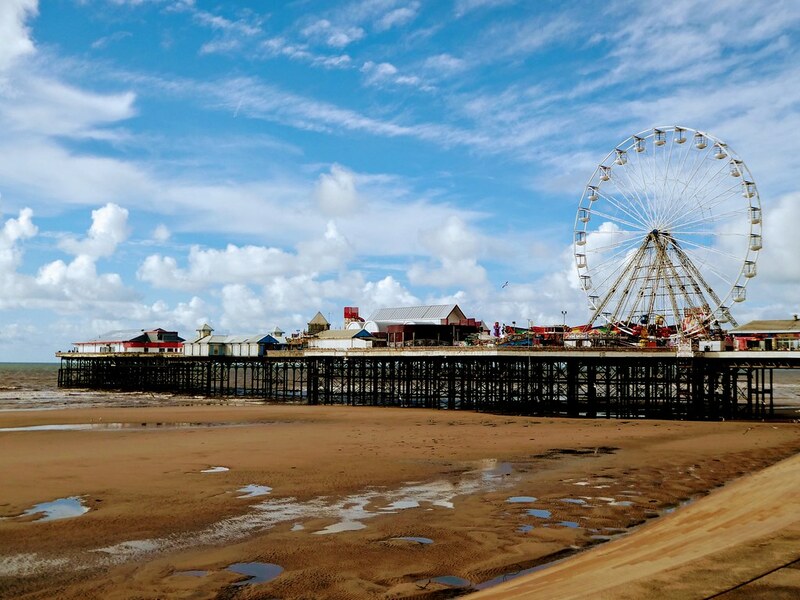 Blackpool is located in the north west of England on Lancashire’s Fylde coast. We travelled by train, arriving into Blackpool North station shortly before lunch. When purchasing our rail tickets we took advantage of the Plusbus scheme available at certain destinations, paying an additional £3.60 each per day for unlimited use of local public transport. In Blackpool standard day tickets cost £5 making Plusbus good value. A few minutes walk from the station we reached the promenade and our first glimpse of the iconic Blackpool Tower. It was a little early to check into our hotel and feeling hungry after our early start, we enjoyed hearty cooked breakfasts and coffee in the JD Wetherspoon Layton Rakes pub. 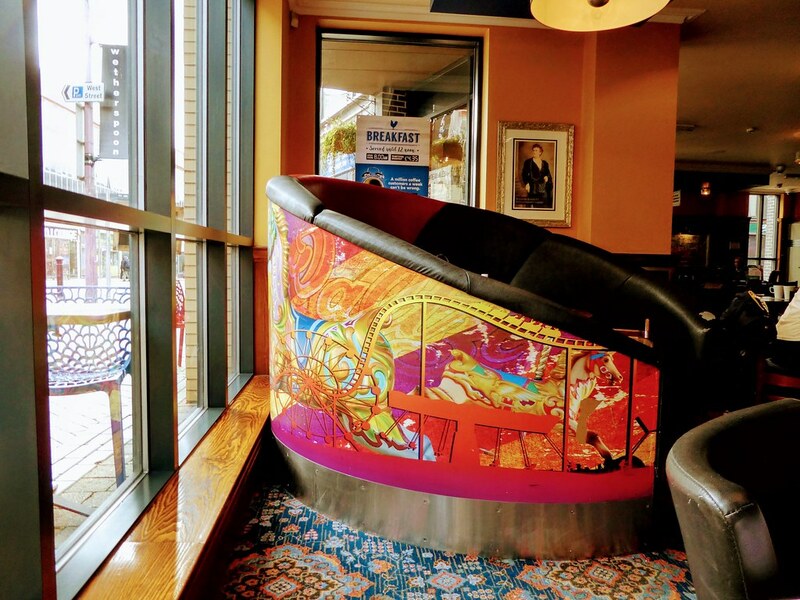 The pub’s interior features a seaside funfair theme with some booth seats styled to resemble rollercoaster rides. Our hotel, the Ibis Styles, was just around the corner in Talbot Square. The hotel, once the historic Clifton Hotel and more recently a Travelodge, overlooks the seafront facing the North Pier having arguably the best position in the town. 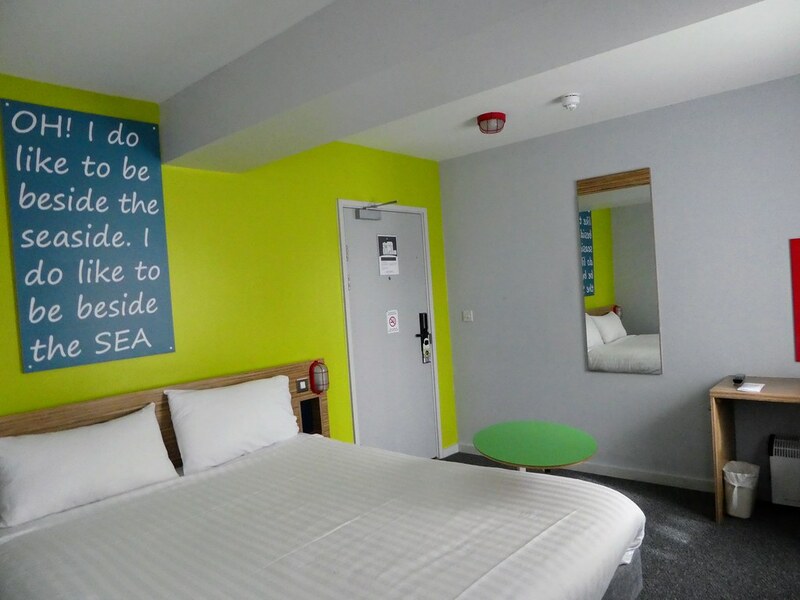 The room, although adequate, was not to the usual standard of an Ibis Styles and I can only assume that the refurbishment programme is ongoing. Check in for our overnight stay was efficient and after dropping off our luggage we crossed the road for a stroll on the North Pier. The oldest of Blackpool’s three piers, it first opened in 1863 as a 500m pleasure pier with a landing jetty. There is no fee to stroll along this English Heritage listed wooden pier jutting out over the town’s Blue Flag beach into the Irish Sea. 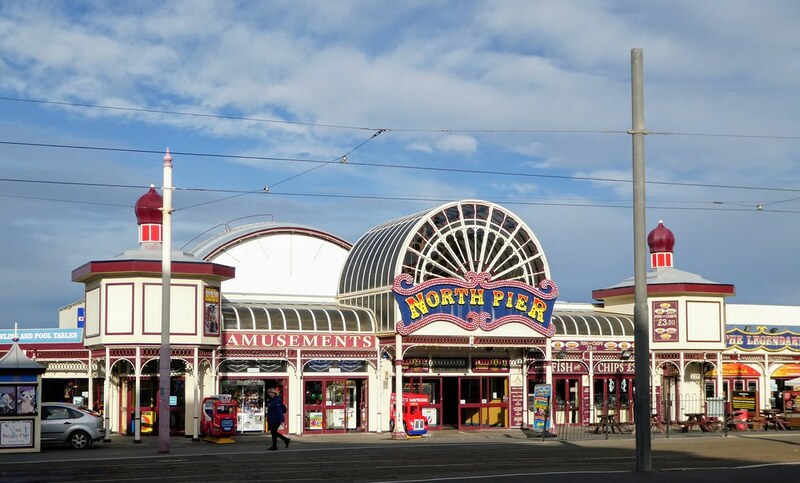 The pier is still in regular use today with its bars, ice cream parlour, theatre and amusement arcade attracting visitors in search of traditional seaside fun. 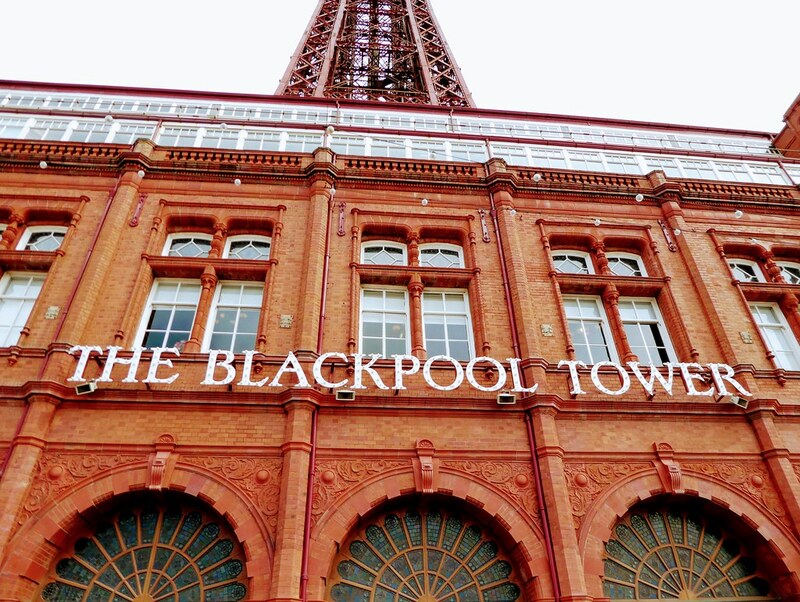 A little further along the promenade lies the famous Blackpool Tower, rising to a height of 158m (518 feet). It was constructed in 1894 inspired by the Eiffel Tower in Paris, however the base of this tower is hidden by a red brick, three storey building which houses a circus, aquarium and the famous Tower Ballroom. Tickets can be purchased covering some or all of the Tower attractions and are 20% cheaper if pre-booked online. We just wished to take the lift to the top of the tower which costs £13.50 per person on the day but as we had travelled to Blackpool by train we were able to take advantage of the 2 for 1 National Rail days out offer which provides a 50% discount on certain attractions if a downloaded voucher is presented with rail tickets valid for that day. Included in the ticket price is a short 4D film about the history of the tower and of the town. On entering the 4D theatre we were handed 3D glasses to wear and stood on one of the raised platforms ready for the performance to begin. I had thought it strange that there were no seats but this became apparent when the film started as the incredible filming included sensory effects with shaking floors, wind and sea spray. After enjoying the 4D cinema experience we were guided to the lifts which take visitors to the top of the tower. 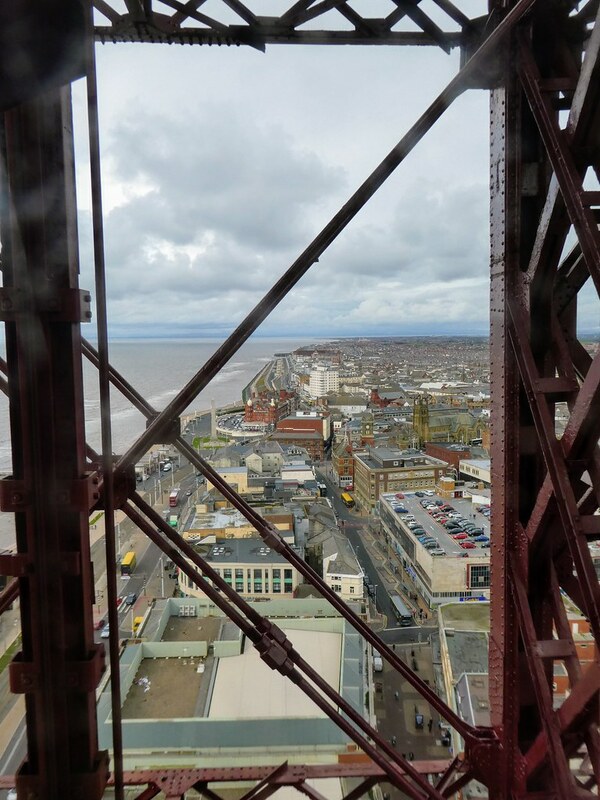 We watched cars and buildings decrease in apparent size through the steel girders as we ascended to the indoor viewing platform now known as the Blackpool Eye. 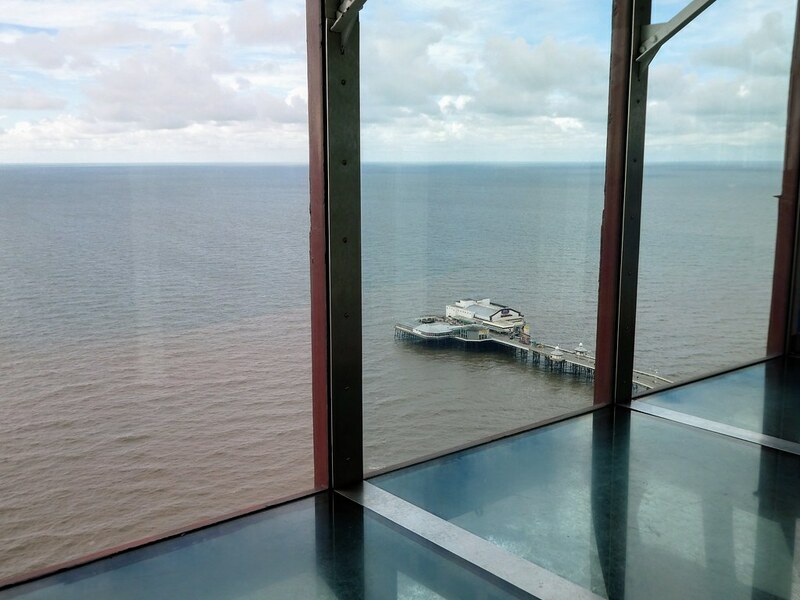 If you have a good head for heights you can take ‘The Walk of Faith’, which is a 5cm glass floor running along the western edge of the tower. Standing on the glass we were able to view the vertical drop onto the promenade directly below and watch a tram pass by. 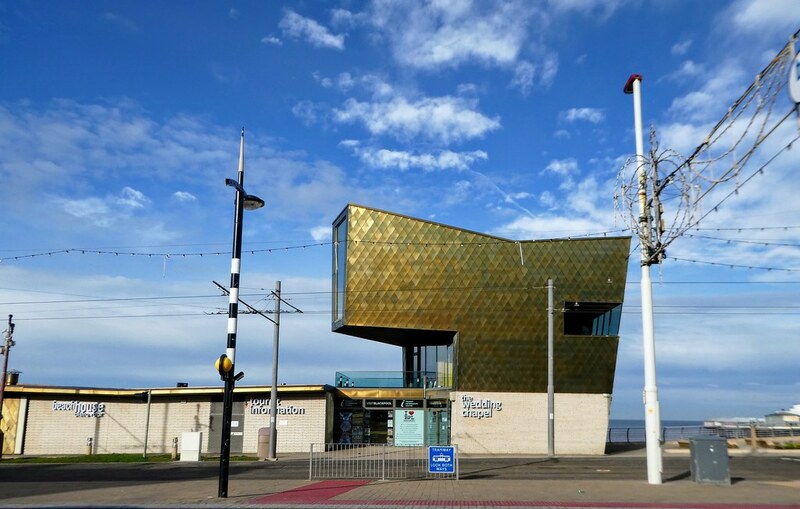 There are uninterrupted views of the north west coastline and over the town from the viewing area which is the highest observation platform in the north west of England. This enclosed viewing area also includes a cafe/bar with seating. 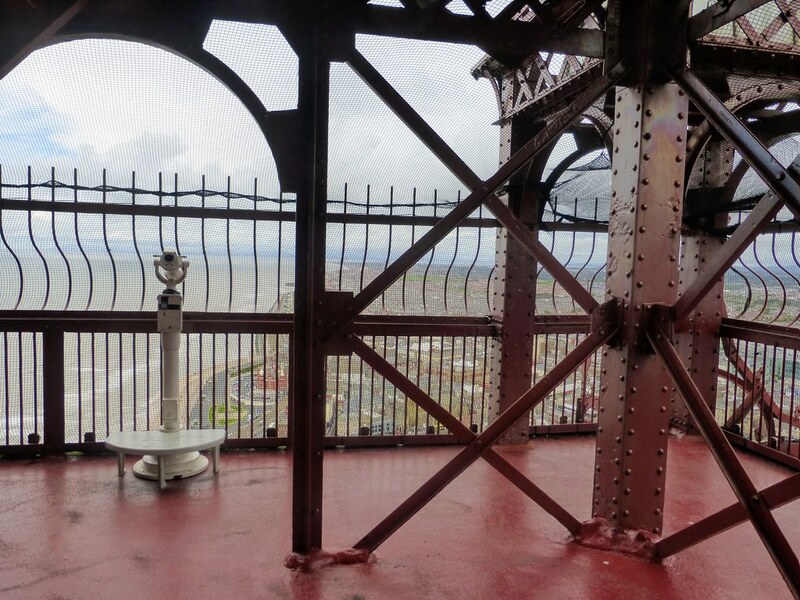 When weather permits it’s also possible to climb up a narrow spiral staircase to further viewing platforms. Although it’s worthwhile making the ascent, the outdoor levels are not very good for photography being covered in protective mesh. It was quiet on the afternoon of our visit but one way staircases operate as it would otherwise be impossible to pass on the narrow stairways. Having enjoyed the bird’s eye views from the top of the tower we took the lift back down to ground level. It wasn’t possible for us to view the beautiful Tower Ballroom as a separate ticket is now needed to enter this elegant dance hall. Pausing at the door, we heard the melodic sounds coming from its famous Wurlitzer organ and caught a glimpse of couples enjoying an afternoon whirl on the dance floor. The ballroom features annually on the calendar of the UK’s Strictly Come Dancing programme and I remember being taken there by my parents many years ago. Leaving the Tower we strolled along the promenade passing the famous Golden Mile with its myriad of slot machine arcades, fortune tellers, fish and chip shops and stalls selling Blackpool rock. Tacky yes, but it’s what Blackpool is famous for, gone are the ‘Kiss Me Quick’ hats but otherwise it’s business as usual. In its heyday, thousands flocked to the resort for their annual holidays from the nearby Lancashire mill towns but since the advent of cheap overseas package holidays with guaranteed sunshine in the 1960’s the town has seen a steady decline in visitor numbers. Sitting shoulder to shoulder from Bispham in the north to the Pleasure Beach in the south, are hundreds of hotels and guest houses. In fact, Blackpool has around 3,000 hotels and guest houses, its hard to believe but that’s more than the whole of Portugal! Our stroll in the bracing sea air continued past the Central Pier with its large Ferris wheel and took us all the way to the South Pier which is much further along. 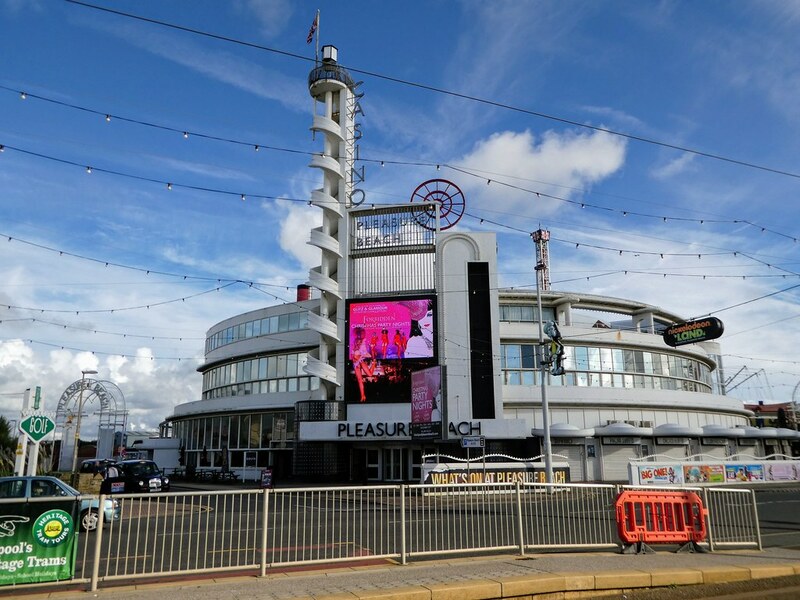 Facing the South Pier is the Pleasure Beach, a theme park featuring a selection of rides from roller coasters to gentler rides suitable for young children. It used to be possible to wander around the Pleasure Beach but nowadays it’s necessary to purchase a wristband to enter. After our lengthy walk we caught a northbound tram to Cleveleys. Trams have run along the Blackpool seafront since 1885 making it one of the oldest tramways in the world. The track is 11 miles long starting from Starr Gate in the south up to Fleetwood which lies to the north of Blackpool. Since 2012 the old trams in the Blackpool corporation green and cream livery have been replaced with modern, low floor trams but some heritage trams still operate in the autumn whilst the illuminations are taking place. 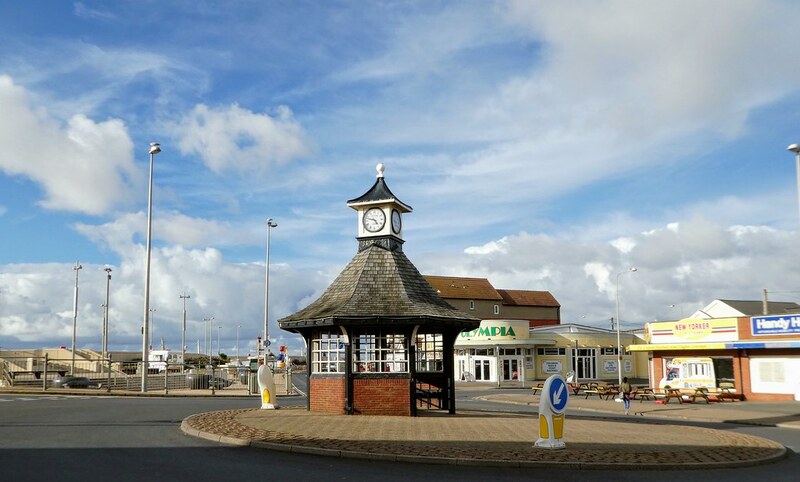 The Plusbus ticket allows travel as far as Cleveleys so we enjoyed a ride along the 30 minute seafront route. It’s many years since I was last in Cleveleys and it appeared much improved from how I remembered it. We wandered along its main shopping street as far as the promenade before returning to the tram stop. It was then back to our hotel for a short rest before our evening activities. Have only ever been to London and Oxford in England but hoping someday to do more extensive travelling throughout the British Isles. Thanks for a lovely visit through Blackpool and greatly enjoyed your photos and commentary. Keep up the good work! Thank you for making contact and for your kind words. Both London and Oxford are great places to visit in the U.K. but there is so much to see and I hope you get an opportunity to return soon. Thank you Helen for your kind words, it’s so nice to receive such positive feedback, especially from a local. I’m glad you enjoyed reading this series of posts. Thank you, I’m pleased you enjoyed my posts on Blackpool. Hello! Love your posts and saw you liked my newest one! I really appreciate it. Im curious how you’ve gotten such amazing amounts of engagement through WordPress? I find it so difficult to get people to even come to my blog! Hello, thank you for your kind words and for taking the time to read my post. I think you just have to be patient and hopefully more visitors will come to your site over time. Thanks for that. I have a photo of my English grandmother at Blackpool as grown woman with some of the “girls” she grew up with in Hull, when she went back to England for a visit, having the sort of carefree day they rarely enjoyed when they really were girls and were out working in service by their teens! How lovely to read about your grandmother’s early life, they had such hard lives but made the best of the situation. I have also some old photos of my grandparents on Blackpool beach, the men wearing shirts and ties ! Wow that brings back memories. It’s years since I’ve been to Blackpool. I hope it brought back some happy ones Samantha! Thanks for your welcome comments. The beach looks so inviting even on a cloudy day! I think the tide had just gone out so it looks a bit muddy, but definitely inviting. I did not had any idea about Blackpool – now I have. Thank You showing wonderful photos. It seems to be a Place worth for a visit. Blackpool is still a very popular seaside town in the north of England and only about an hour from Manchester. I’m pleased you enjoyed this post. It’s famous Illuminations will follow shortly. Beautiful photos and great write up. Thank you for your inspiring comments. It’s reading things like this that gives me the confidence to continue writing. Great post that brought back some memories. It’s been almost 50 years since I visited Blackpool and I was only there for a few days but I remember seeing the illuminations and the tower. We didn’t spend much time at the beach because it was off season and bitterly cold. Thanks Sue for your kind thoughts on the first of my Blackpool posts. It’s good to read that it brought back some happy memories for you. Illuminations are coming up next! So much to see, and the weather looked delightful. You must not have a fear of heights if you could stand on the transparent floor at the top of the tower. Do you know Susan I must be getting braver as I can remember refusing to stand on glass concrete in the past but now I seem to be OK with it! Glad you liked the post. Blackpool is certainly a fun hotspot of the U.K. I’m so pleased you enjoyed my first look at Blackpool. Great post & photos! I’ve been once when I was younger so definitely didn’t get to see everything. Thanks Zoe for your kind words. 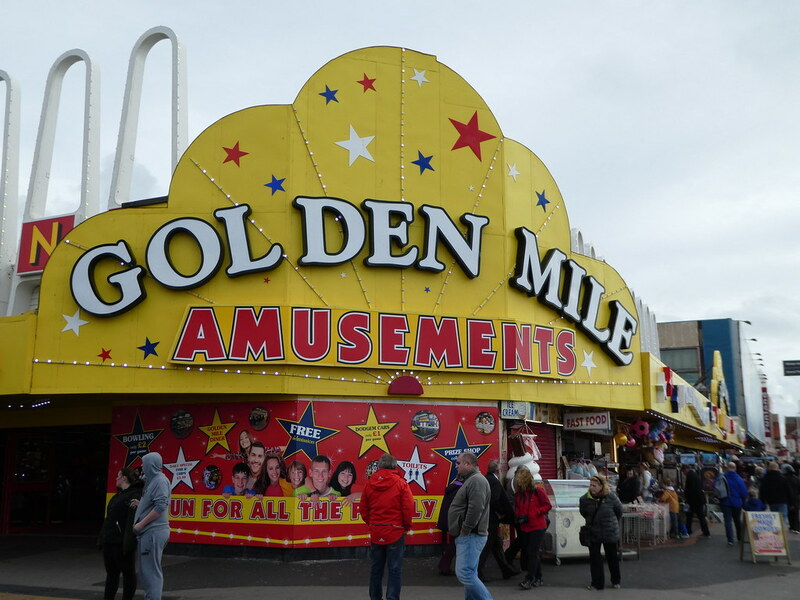 It’s so good to read that you enjoyed the first post of my series on Blackpool. I live in Southport, which is a stone’s throw away from Blackpool. When I was little, my family and I would make many weekend trips over there and we always had the best times. Reading your post has filled me with the urge to make a trip over there sometime soon and be a complete tourist for the day. Thank you for your kind words Jo. I actually know Southport quite well as I used to go there often with my parents. Somewhere else we need to re-visit, hopefully next year. What a great trip down memory lane for me Marion. Thank you!! Love your photos. Haven’t been there for decades but my nana took me and I won a beauty contest. I think I was about five years old. Ha ha. How lovely that you remember visiting Blackpool so long ago. Some things like the tower and piers haven’t changed that much. The seafront promenade is much improved now though from what I can remember. Great post, very informative! 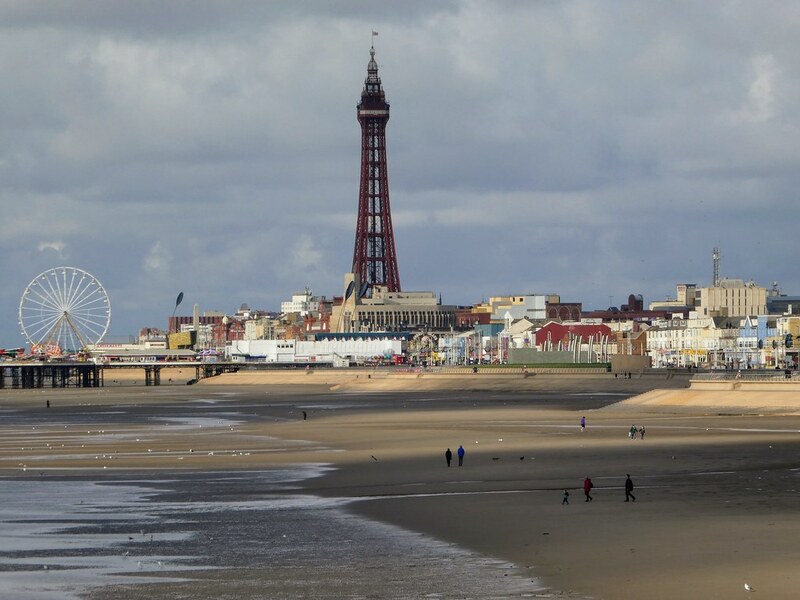 I used to live in the UK, was there for 7 years and never went to Blackpool because it always looked a bit grey and grim to me. It can be like that but it’s traditional seaside for the U.K. along with Brighton and Bournemouth in the sunnier, south! Gorgeous! Love the coastline pic. Thanks Ingrid, the views from the top of the tower were really good and worth the ascent. Loved the view from the tower but was surprised to see how muddy the coastline is when tide is out. I think the tide had only just gone out Ian but as you go further north towards Morecambe Bay it gets very muddy there. Having never been to England, I guess I have a new place to be at other than London. The entire post seems to resonate the vibes of Blackpool and lure you to visit it. Thank you for your inspiring thoughts on my Blackpool post, hopefully one day you may get an opportunity to visit. I would be so curious to see the dance hall in person! 😃 gorgeous pictures by the way, thanks for sharing all this info! Thank you Caterina for your kind words. It’s so pleasing to read you are enjoying my posts. That’s right, it’s just nice to walk by the sea, breathe in the fresh air and hear the seagulls! 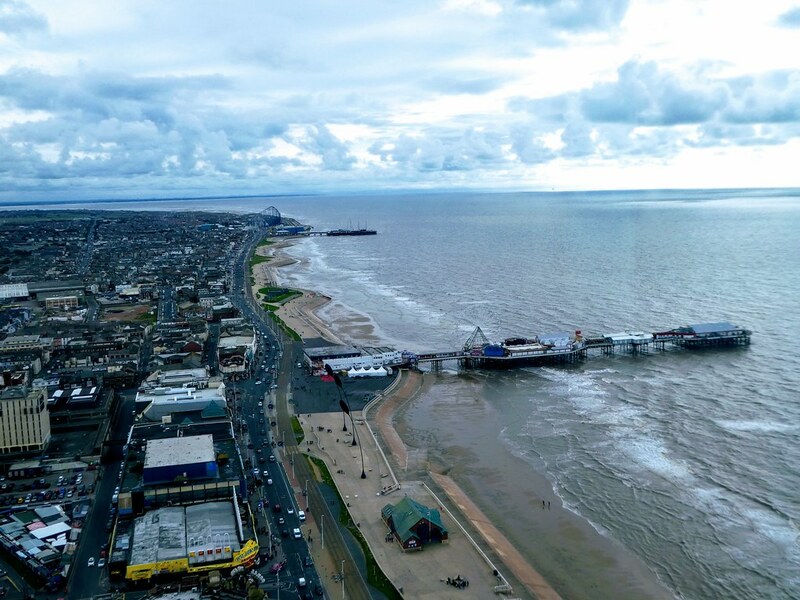 It’s become a bit of an annual thing for us to take a trip to Blackpool, we bring our bikes and spend the day cycling from one end to another along the promenade – they’ve done a great job with this area I think. We do the same thing every time – walk along each of the piers, read those jokes on the ground outside the tower and finish up with fish and chips. We went up the Tower a few years ago and loved the 4D experience and the walk of faith. I was really excited about going to the ballroom (I had been with my parents years ago too) but it was closed for a private function. What a shame the ballroom was closed. I also think they have made a great job of the seafront, it’s just the regular trams that disappoint me,. They are functional but now they are just the same type as Manchester or Edinburgh. What a great place to cycle though, nice and flat – that’s where I need to cycle, or Finland! Visited there in 2001 and enjoyed it immensely. Reminded me of the old amusement parks and seaside towns we had here in Southern California in the 50’s and 60’s. So much fun to stroll around. Sad to hear that the amusement park charges now to enter as it was great one day just to stroll through and see the rides and attractions. Hello Terry, it’s so good to read that you visited Blackpool back in 2001. Some parts haven’t changed but it’s a shame the old trams have gone, I realise that these low floor trams are easier for wheelchairs and pushchairs but it’s a shame they all had to go as you could be anywhere now. It’s only in recent years that you have had to at an admission for the pleasure beach, like you, I loved wandering round there. Thank you for your welcome thoughts. Thanks Summer for getting in touch. Blackpool has changed in some ways but still very recognisable. I’m glad we made the effort to return for a weekend. Blackpool certainly sounds like a great destination. You crammed a lot into your day. Looking forward to the next installment! Thank you for your kind words and taking the time to continue reading my posts. It’s much appreciated and Blackpool is certainly a great destination! 3,000 hotels. That’s mind boggling! Are there really that many people wanting to go to Blackpool?! I could hardly believe that there were 3,00 hotels and guest houses either. I read it on a sign at the top of the tower but cross checked the information before posting. Apparently occupancy rates are only 30% but I suppose this fluctuates over time. That is a truly amazing fact! It can get extremely busy in Blackpool at weekends and during the illuminations but you can always find a quiet corner along the seafront away from the crowds. Thank you for your welcome comments. Nice memories. I always say never again to Blackpool but somehow end up back there every few years. I went for my birthday about 3 years ago because an Agatha Christie production I had missed in Birmingham was showing 🙂 We enjoyed the weekend (got a room upgrade thanks to the cleaner being slack) however it is sad the amount of drunks there are in the town. Blackpool isn’t our usual type of short break but, like you, I seem to get drawn back there now and again. Good that you got a room upgrade too! Yes, I thought how nice they have left a stack of magazines and a bottle of water for our arrival. Then on closer inspection, errrmmm nope. Previous guests’ trash. Lackpool – a little different from your usual destinations. “Kiss me quick” hats and Blacpool rock in order? Yes, very different but nonetheless interesting for a short break! Fabulous photos! Having never been to England, you have done a great job of promoting and describing Blackpool. Thanks. Thank you for your inspiring thoughts on my blog post on Blackpool. It’s lovely to read! Hope you enjoy the other two posts in this series.